Cometa Açaí is a little different from most juice shops in Salvador – and certainly a lot newer – we remember it was under construction last year when we were in Salvador, and this year it is clean, bright and open for business. Cometa is definitely a little more upscale than neighboring açaí places in Salvador, and we appreciated the spacious, open seating area, which was raised above the sidewalk. This feature allows you to avoid sidewalk traffic and parked cars (unlike the other places on Rua Miguel Bournier). The menu is typical of the other juice shops in the area with Açaí bowls and assorted juices, though there is also a little selection of sandwiches and even some temaki sushi rolls (for R$12-18) though ordering sushi at a juice bar is maybe a little weird. Value: 4/5 Our 400 mL bowl of açaí was a respectable R$8.90, with no extra charge for granola. You pay a little extra for strawberries or bananas. Taste: 12/15. This was more of a Para-style açaí, with a little more sweetness. Overall, we have decided we like this flavor profile a little more than the super-sweet Rio variety. Texture: 8/10. Overall this açaí was pretty smooth, but had hints of icy graininess that could have been improved. Granola: 5/5. We received the standard Tia Sonia granola that you get in Salvador – but we didn’t have to pay for it! Extras: 5/5. Though you don’t have much of a view – this was our favorite seating in all of Salvador (at least so far). It’s definitely a place you can linger over your bowl. TOTAL: 34/40 – Pretty respectable! The Best Açaí in Rio de Janeiro! How time flies! Our time in Rio de Janeiro has drawn to a close, and we are in Salvador da Bahia now, which means it is time to tabulate the results for the best açaí bowl in Rio. We had a lot of fun sampling açaí spots all over the city, and you can see all of our reviews below. Along the way we learned the difference between regional styles of açaí and sampled more granola and tapioca puffs than we’d ever imagined. So without further ado…. Incidentally, the best açaí bowl in Rio, at least according to our metrics, was the last bowl we tried! Tacacá do Norte had near-perfect Northern-style açaí, with a good price point. Our top Carioca-style açaí was at Polis Sucos. 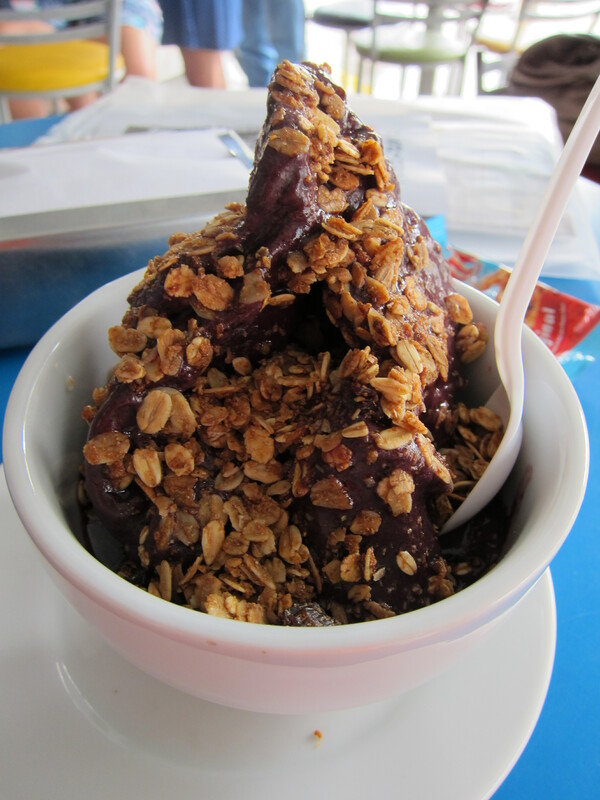 Our trip to Rio de Janeiro introduced us to the Northern style of açaí popular in Pará. Tacacá do Norte, named for the unique Northern Brazilian soup, “Tacacá,” is tucked away on a quiet street in the residential neighborhood of Flamengo. Tacacá do Norte is a small diner-like affair, with seats wrapping around a circular counter. The menu is small, and the sign advertises “Sucos e Artigos de Belém do Pará (Juices and articles from Belém in Pará)” which includes northern favorites like Tacacá soup, casquinha de siri and of course açaí (in either 400 or 600 ML bowls). There was also a small section of Northern goods for sale, including the classic cuia gourd bowls for serving Tacacá. Value: 1/5. Our heaping bowl was very generous for R$ 14 for 400mL and R$ 16 for 600mL. It should also be noted that the restaurant is cash-only. Taste: 15/15. There was pure açaí flavor at Tacacá do Norte – but they pre-added the sugar for us! This was awesome – since at Barraca do Pará we always felt we had too much or too little when we mixed in our own sweetener. At Tacacá do Norte the sweetness level was just right! Texture: 10/10. The açaí at Tacacá do Norte had the best texture we experienced anywhere. It did not melt at all, and was smooth and creamy throughout. Granola: 5/5. The topping was, no surprise, tapioca. It came in a pour container and was the best tapioca of the bunch so far. Extras: 5/5. There was a very friendly atmosphere at Tacacá do Norte: bustling environment, convenient seating, Amazonian menu, unlimited toppings and 2 spoons – we’re in love! TOTAL: 36/40 – Tacacá do Norte takes the lead with a strong showing. In the heart of Centro (our neck of the woods) we visited Pioneiro dos Sucos, which is a really basic, local, stand-up only açaí place, mentioned on Todo Rio. The juice bar always seemed to be full of locals and office workers so we figured it certainly would be worth a try. This type of simple stand-up juice bar is prolific in Centro. 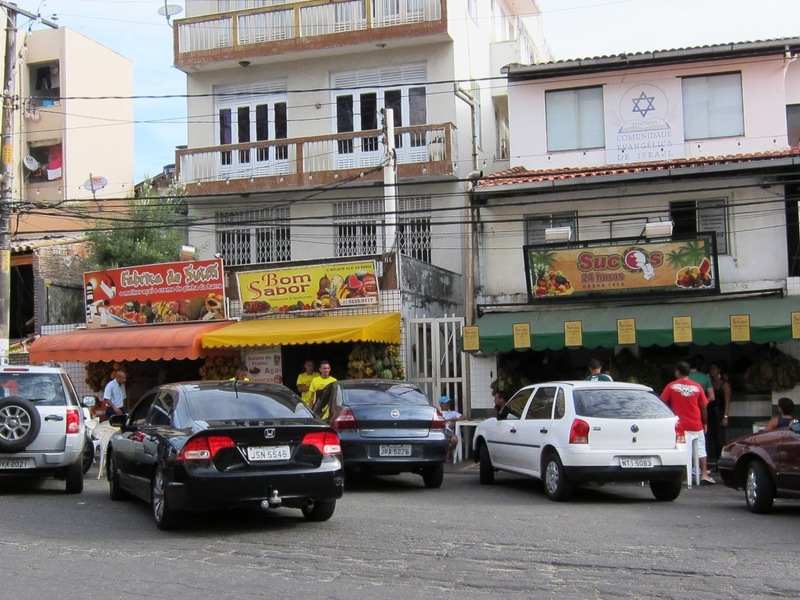 People go to these kinds of places to get a cafezinho or a juice and snack before/after work and at lunchtime. There are also sandwiches and more substantial items, but the majority of people just grab a snack and go. Value: 5/5. Açaí was $5.80 for a 300 mL cup – with R$1 extra for granola. This was the cheapest price so far for a 300 mL cup in Rio. No complaints so far. Taste: 10/15. Pioneiro do Sucos had a nice açaí flavor with a generous mix of fruits (probably strawberries and blueberries). Texture: 7/10. The açaí had a decent texture, but tended towards icy and a little grainy. Granola: 0/5. This is where our visit screeched to a halt. Now this was definitely a basic type of place, so we went in with modified expectations. However, everything went sour when we found a small black bug (beetle-ish) in our cup of granola. Gross! We stopped eating the granola right there, hoping it was a fluke. We figured the bug could have flown in from the street. However, we then discovered a SECOND bug deep in our cup of granola. That was it for us. Extras: 0/5. So we were prepared for the lack of seating and bowls, and receiving no spoon, however the unclean atmosphere ruined the experience for us. Bugs in granola = bad vibes. TOTAL: 22/40 – Probably best avoided. We had our first experience with Northern-style açaí at Amazônia Soul in Ipanema, and we were hooked. When we visited the Feira de São Cristóvão, a fair full of Northeastern Brazilian culture, music and food, we were expecting carne-de-sol and other savory northern specialties, but somehow didn’t think about açaí. However, we were overjoyed to stumble across Barraca do Pará in the labyrinthine Feira. As its name implies, this little restaurant specialized in cuisine from the northern Brazilian state of Pará, such as Tacacá or Vatapá, along with delicious Northern-style açaí. We actually visited this Barraca on two separate occasions and we were pleased by the quality and consistency each time. Value: 0/5. Our heaping bowl was very generous for R$ 15. Taste: 14/15. Again, the açaí at Barraca do Pará had very strong flavor, similar to what we had at Amazônia Soul. This is pure açaí, with none of the fruit blend at Southern-style places. In order to get the desired sweetness, you were given a large tub of sugar, and you added your own amount. Regrettably, we never really reached the perfect sweetness level. Texture: 10/10. The açaí had an amazing texture. Absolutely no melting, even when we got to the bottom of the bowl. Granola: 5/5. Again, we opted for the tapioca as the açaí topping, which was excellent. We also loved that the tapioca came to the table in a giant pouring container, so you can add all you want. Extras: 5/5. There was tons of seating, a full menu of Paraense cuisine, unlimited toppings and 2 spoons – we’re in love! TOTAL: 34/40 – A very good showing. This is our favorite Northern-style place yet. Now that we are back in Brasil our açaí quest has been renewed with full force. Though there were a variety of options for açaí in Salvador, Rio is really the place for the açaí-lover. There is a juice bar on nearly every corner, and some of the most famous açaí shops are located throughout the Zona Sul beach area. We did a little research beforehand, and compiled a list of açaí places to try. First on our list: Polis Sucos. 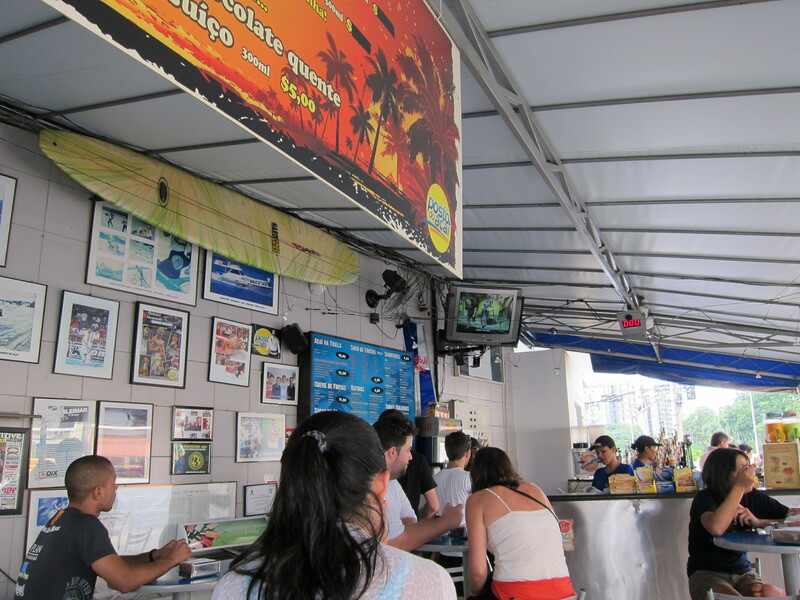 Polis Sucos is one of the most popular places for juices and açaí in Rio; and the Ipanema location is the most famous. You can spot the distinctive Polis Sucos corner store from blocks away, and when we approached the place was already full! The counter was stocked with fresh fruit, and the menu is appropriately composed of mainly fruit juices, smoothies (vitaminas and batidos) and açaí blends. Polis Sucos is conveniently located right next to an Italian gelato place if you want to follow up on your açaí with another sweet treat …maybe next time. Value: 3/5 We got an açaí granola cup for R$11.50, for 500 ml. Taste: 15/15. This açaí was easily one of the best we have had, anywhere in Brazil. It had great açaí flavor without being too sweet, with just the right amount of berries mixed in. Texture: 9/10. Polis had an excellent, smooth texture that held up well, even with a little melting. We had previously ordered a batido – which meant the açaí was blended with granola, which had an excellent texture. We decided to try it this time non blended – and the texture was still great. Granola: 5/5. The cup came with standard-issue granola (no extra charge), which came in a separate plastic cup. Extras: 2/5. This was a mixed bag. In addition to the range of juices, there are other more savory option like sandwiches and hamburgers (cheesefrango, cheddaregg, etc), so you are set for choice. However, Polis Sucos is a popular place, and there is no seating, so prepare to stand, unless you can squeeze into one of the surrounding benches that are shared by Polis Sucos and the gelato place next door. There were also no bowls of – only cups. TOTAL: 34/40 – Polis is our front-runner so far. We enjoyed our açaí at Polis, and it is definitely worth a trip if you are in Ipanema. So we consider ourselves at this point to be (sort of) açaí experts, but we were totally floored by our completely different experience at Amazônia Soul in Ipanema, right off of Praça General Osório. Northern açaí is completely different from its Southern variety since the emphasis is on pure açaí flavor. Amazônia Soul is a store concept from the northern state of Pará – and along with delicious Northern-style açaí – it also has a selection of typical Northern dishes including tacacá, crab and maniçoba and Nothern-style feijoada. Don’t forget to wash your meal down with a Guaraná Jesus – a popular regional soda brand. The store itself is very inviting – with a distinctive abstract frog mascot (we think it is a frog) and a little shop inside selling Amazonian products including jarred sweets, ceramics, stoneware and jewelry. Value: 0/5 Our pequena small bowl was definitely less than 500 mL (we think it was 300 mL), and it was extremely expensive. Total: R$ 16. We had a little bit of sticker shock on this one. Taste: 12/15. Amazônia Soul presented us with the purest açaí flavor yet. Northern style açaí is simply açaí and ice, instead of an açaí/berry/ice blend which we have come to learn is standard at most Zona Sul places. The taste of pure açaí is extremely strong, and not necessarily sweet, so it is typical to add your own sugar to the bowl. At Amazônia Soul you are given sugar packets to sweeten things up. Texture: 10/10. Perfectly smooth, this açaí did not melt at all. It also seemed like there was less ice in this formulation – which means less melting. Granola: 5/5. In this case the topping was not granola at all – but a bowl of puffed tapioca – which is standard for Northern-style açaí. There was a surcharge for the toppings of $R 2. Though we think we prefer granola over tapioca, we felt we had to go for the authentic experience. Extras: 5/5. There was a nice indoor seating area, along with wooden tables outside. A plus – we got two spoons on the first try. TOTAL: 32/40 – Again the value hurt them, but there was a narrow lead. Our search for the perfect açaí bowl continued in the beachy Zona Sul area of Rio de Janeiro. We heard that Kicê Sucos served tasty açaí in a laid-back setting in Copacabana, so we quickly added it to our list. Kicê Sucos had more of an old-school vibe, unlike the slicker Polis Sucos and Bibi Sucos. Like Polis Sucos, Kicê is located on the corner of the street, with a counter wrapping around a semi-circular space. We were heartened to see the piles of fruit on display (as must, as we have learned). Omnivores will also be well taken care of due to the expanded menu of sandwiches. Value: 1/5. Our bowl was generously sized, and cost R$12, with a R$2 extra charge for granola. It seems that most of the suco places in the Zona Sul beach area always charge extra for granola – just something we will have to get used to…unfortunately. Total: R$ 14.00. Taste: 11/15. The bowl had a nice açaí flavor, with possibly some strawberries added in, but not as much açaí flavor as at Bibi Sucos. Texture: 7.5/10. Overall the texture of this açaí bowl was pretty good, though a little gritty. Unfortunately the bowl melted very quickly. Granola: 4/5. The granola came in a separate cup as seems to be the usual in Rio – but there were no cashews – disappointing the cashew-fiend M.
Extras: 4/5. Kicê Sucos has an extensive menu with many sandwich options, and a full line of juices, including our enigmatic favorite clorofila. There was only counter seating available (or to go of course), and we were lucky enough to get seats, but many weren’t. As a plus – they gave us two spoons. TOTAL: 27.5/40 – Pretty good, but not enough for the value. The Mystery of Clorofila juice solved? In Salvador da Bahia we tried a mysterious green liquid called “clorofila (chlorophyll)” at a juice bar that tasted somewhat unpleasantly like green bubblegum. However we have not been able to decode exactly what it was, or if the shocking green color was the result of a natural ingredient or dye. However we think we have decoded one of the major ingredients which would indeed give a natural green color – wheatgrass! We saw the sign below at Kice Sucos in Copacabana, which advertised Clorofila as a wheatgrass drink (broto do trigo). Though the drink we had in Bahia was surely mixed with other fruits and juices (as is advertised here), we now know why it was green. Thanks, Kice Sucos! Bibi Sucos, located just past the Leblon/Ipanema border in Rio’s south zone, is an inviting place for sucos in an area of the city full of choices (Bibi has a few other locations in the city, including Barra). With an extensive menu of juices, sandwiches, and other options, it seems to be as great of a meal spot as an açaí destination. L&M, spending the day in Leblon, felt Bibi Sucos was worth a stop – our second in our quest to find the best açaí bowl in Rio! After some initial confusion over the menu – which does not denote mL sizes for the bowls – we settled on a pequena, whose size, as seen below, does not really fit with the name. Value: 1/5 Our pequena (by the look of it, about 500 mL, or more) was R$12.50, with a R$2 extra charge for granola. The extra granola charge put us off a bit, and raised the price. Total: R$ 14.50. Taste: 12/15. Very good. Our açaí had a tasty açaí flavor with a few added fruits, but had the tendency to be slightly bitter in places. Texture: 8/10. Overall smooth, but had hints of graininess that could have been worked out. Sometimes the graininess can be a good thing, but if it gets hints of gritty, we find it to be a turnoff. Granola: 5/5. In a separate cup with cashew bits? Five points! Extras: 5/5. Great other factors at Bibi. Extensive outdoor seating for a sucos places, along with refreshingly prompt service. The menu, in addition to an impressive range of açaí add-ons and sizing options, had a wide range of sandwiches, burgers, omelets, and salads available (all of which looked delicious). Best part: this was the first place to give us two spoons without us asking for them! TOTAL: 31/40 – Good enough for the smallest of leads over Vero Suco, our go-to place in Centro. Açaí from Vero Suco with a cup of granola – a nice extra! Value: Out of 5. The typical price for an Açaí na Tigela ranges from 6 to 10 Reais for a bowl (typically 500 mL). You get points based on your cost: Below R$8 = 5/5; 8-9.99 = 4; 10-11.99 = 3; 12-13.99 = 2; 14-15.99 = 1; 16 and above = 0. Taste: Out of 15. It has to taste good – and taste like Açaí rather than a random fruit blend. Granola: Out of 5. Quantity and quality of granola, a very underrated aspect of the Açaí bowl! Extras: Out of 5. This is a somewhat more intangible category. For example – do they give you spoons (sometimes this doesn’t happen)? Is the setting decent? Can you sit or do you have to stand? So here we go – hopefully by the end of our stay here we will have some definitive results for the best Açaí in Rio. Anyone have any recommendations for us to try? Vero Suco is a typical Brazilian juice bar – fresh fruit piled on the counter, a somewhat dated 1980s look and a giant menu (and conveniently located just steps from our apartment!) There were also a variety of sandwiches also for sale for less than R$ 10 apiece. They were passable, but the juices and açaí were definitely the stars of the show. We got an açaí bowl for 8.90, which had 500 mL of açaí . We went two times: the first time the bowl had an excellent taste and texture, but was a little disappointing the second time. Regardless, Vero Suco was the first place in which we were served granola in a side dish. We are used to a small sprinkling of granola or a small granola packet. However, the bowl of granola was a revelation! This way, we can add granola as we see fit, bit by bit. A standard granola package has too little for an entire bowl, and getting it batida (mixed in), while tasty, denies you the visual appeal of fresh granola on top of the purple açaí. This was one of our favorite açaí bowls in Rio so far, and we enjoyed the price and the copious amount of granola. Value: 4/5. A 500 mL bowl, with free granola, was R$ 8.90. Taste: 10.5/15. Very good. Tasty, but could have brought out more of the fruitiness in the açaí and other accompanying fruits. Texture: 7/10. Good. Our first visit was easily 9/10, but our second visit it was too grainy. We worked out an average score here. Granola: 5/5. Excellent. Served in a separate cup, including two full cashews. Extras: 4/5. Seating is provided (always a plus), but like all places in Centro, is inside and a little crowded/stifling. This is made up for by the brightly painted walled and extensive fruit decorations. Service is prompt and efficient, but they lose a point for not bringing us two spoons! While there, we also decided to try some of Vero Suco’s actual juice offerings. Beyond the more typical juices of abacaxi (pineapple) and maracuja (Passion fruit) we were excited to see beterraba (beet), acerola, graviola and cacau juices. The one that intrigued us the most was cacau, which means “cocoa” in Portuguese. M, of course, upon seeing this on the menu ran up to the counter to order one. We soon found out, however, this is not a chocolate juice. Much like another popular Brazilian juice, Caju (cashew), this juice is from the flesh of a fruit usually harvested for nuts. So cashew juice is from the fruit of the cashew, cocoa juice is from the fruit of the cocoa. The fruit is particularly mild, and doesn’t really taste at all like chocolate. It seems appropriate that for our last post before leaving for Brazil we post about one of the newest Brazilian spots in Chicago, and one which has quickly become one of our favorites. So you may know that we have long been on the hunt for Acai away from Brazil. This hunt led us to Brazilian bowl, which opened up last summer in a convenient Lakeview location. Brazilian Bowl is a brightly-colored restaurant, whose focal point is a large ice cream counter and a “Brazil Bowl” assembly area (more on that later). Much like Feel Rio in Lisbon, Brazil Bowl is bringing to Lanchonete to the Brazilian diaspora. The focal point is the “Brazilian Bowl” which is an assemble-yourself bowl of your choice of meat over rice, and with a wide variety of Brazilian-inspired toppings. ($6.95 for Steak, Turkey, Pork, or Sausage; Vegetarian is only $6.15). For main courses, Brazilian Bowl also has typical Brazilian classics like Feijoada (7.95) and a Bahian-inspired shrimp dish with yuca, dende oil and tomatoes ($8.95). M piled his Brazilian bowl high with fixings: opting for the steak, he paired it with a veggies, corn, lettuce, cheese, and a variety of spicy sauces. While the result was filling and tasty, it was not exactly brazilian. We doubt you will ever find the dish anywhere in Brazil. Perhaps Brazilian bowl is to Brazilian as Chipotle is to Mexican food? But at the same time, a tasty and filling inexpensive lunch spot is not a bad thing, especially with this variety of flavor options! However, the real star of Brazilian bowl were the fruit options, including our favorite, the açaí bowl. There were two options – $6.95 a piece for either acai/blueberry/agave, or acai/banana/honey. The açaí was delicious, and definitely one of our favorite in Chicago – creamy and with a good amount of toppings. It transported us directly back to Bahia. You can also get smoothies for $3.75 with creative Rio-based names like Copacabana ( strawberry, banana and apple juice) and the Ipanema (Mango, banana, kale and coconut milk). In terms of salgados (salty snacks) there are Brazilian Empanadas, Empadas, with a variety of fillings ($2.25) as well as the chicken-filled coxinhas ($2.25). We were also delighted to sample some pães de queijo (2 for $.195, 5 for $2.95, 10 for $5.49). We make a pact to try these at every Brazilian restaurant, but we are sad to say that these pães were almost a little too cheesy – who would have thought wed ever say that? Mainly because it threw off the typical tapioca-to-cheese ratio. Next time we will be sure to sample some of the exotically-flavored gelato in some unusual flavors ( such as açaí- yum, or goat cheese). For the açaí bowl alone, we will definitely be back to Brazilian Bowl, post-Brazil. We did not set out looking for Feel Rio – it found us while we were on our way to the iconic San Justa Elevator in Lisbon. However, when did we ever refuse an açaí bowl? Feel Rio had a traditional Brazilian lanchonete snack bar menu: açaí bowls, smoothies, salgadinhos, and some sweet snacks. There are only a few tall tables around the front of the store by the window, and it seemed to be mostly a popular takeout spot. Even beyond snacks, Feel Rio seemed to be a meeting point for the Brazilian community of Brazil, and there were flyers and postings about Brazilian businesses and events in the area. We ordered our two favorite Brazilian snack dishes from our time in Salvador: an açaí bowl, topped with banana and granola, and a couple of pães de queijo. They made their smoothies and açaí bowls out in the open with fresh fruit, so you could definitely tell they were fresh. On the downside, the pães’ cost seemed a little steep. But to our surprise, they were excellent: a firm crust, a cheesy center, not too gluey, and warm. Potentially the best we have had outside of Brazil! The açaí bowl, however, was more of a disappointment. It was quite sizable, and came with a topping of bananas and guarana syrup (the granola was extra). While the flavor was alright, it came out with a surprisingly grainy texture, not the milky smoothness you would expect. Perhaps too much açaí concentrate? No matter though. After our famously unsuccessful attempts at trying to recreate the açaí bowls at home, who are we to judge! We liked that Feel Rio brought the lanchonete concept to Lisbon. Feel Rio is a perfect place for a snack, a light lanche or a juice when you are in the Chiado area. Though Lisbon may be a far cry from the beaches of a Guanabara bay, you can still pop in for your Carioca-style Açaí. One of our favorite things to eat for breakfast is an Açai Bowl, one of the few recipes from Brazil that we have NOT been able to perfect back in the states, sadly. So we were very excited to learn from Chicagoano about the opening of Brazilian Bowl in Lakeview (3204 N Broadway). The store, specializing in Brazilian food (including some of our favorite salgadinhos), opened its doors over the weekend, and our friends who went said they are fans. We are looking forward to going to Brazilian Bowl to test out some Açais very soon! Only in Brazil, right? While we previously rated our favorite açaí spots in Salvador, açaí bowls are extremely popular all across Brazil. São Paulo, of course, is no exception, and as usual we were excited to find a relatively crowded local açaí watering hole only a block from where we were staying in Sampa. Normally, we would usually give little credence to a restaurant in a gas station – technically sandwiched in between two gas stations – but that is exactly where we found Posto do Açaí. Our first time through was by accident – just stopping under their roof to get out of the all-too-typical Sampa drizzle – and we were initially baffled by the Brazilian jiu-jitsu paraphernalia on the walls. Turns out it’s a chain, and they sponsor a series of Brazilian martial arts groups. But, even better for us, we found Posto do Açaí to be surprisingly decent açaí in the heart of São Paulo. The menu, similar to most açaí joints, contains no real surprises: açaí na tigela with various toppings; juices; and juice milkshakes (batidas). However, points to the Posto for offering an interesting twist, presumably descended from São Paulo’s rich history of Italian immigration: a wide variety of Italian flavor syrups to add to any açaí bowl or drink (for a surcharge of R$2). We sampled the Sicilian orange and lime beaten into a bowl, topped with granola, and felt it was on par with some of our favorite places in Salvador, especially given the extra exotic fruit. We also sampled one of their range of Italian sodas – not bad for a gas station joint! It seems that each new country we visit has an everyday snack treat that comes to us as something of a revelation. In Greece it was Yogurt and Honey, and in Brazil it must be the açaí bowl, known here as Açaí na Tigela. Açaí fruits, the product of a species of palm tree well-known in Brazil, has been making the rounds in the United States since about 2004, advertised by the health-conscious for its “antioxidant” properties (which has no factual basis, sorry to say). So why do we like açaí? Because its dark, sweet, rich pulp makes for some darn good eats, especially when – Brazil style – you blend it, ice it, top it with fresh fruit and granola, and serve it up in a plastic 700mL bowl all for around R$10 (about US $5.50). Yes, please! Luckily for us, three great açaí bowl establishments are just down the road from our apartment in Salvador: Fabrica de Sucos (“Juice Factory”); Bom Sabor (“Good Flavor”); and Suco 24 Horas (“24 Hour Juice”), winner of nine consecutive “Best Açaí” awards from the annual food issue of Veja Salvador. We decided not to trust the food critics – isn’t that our job, anyway? 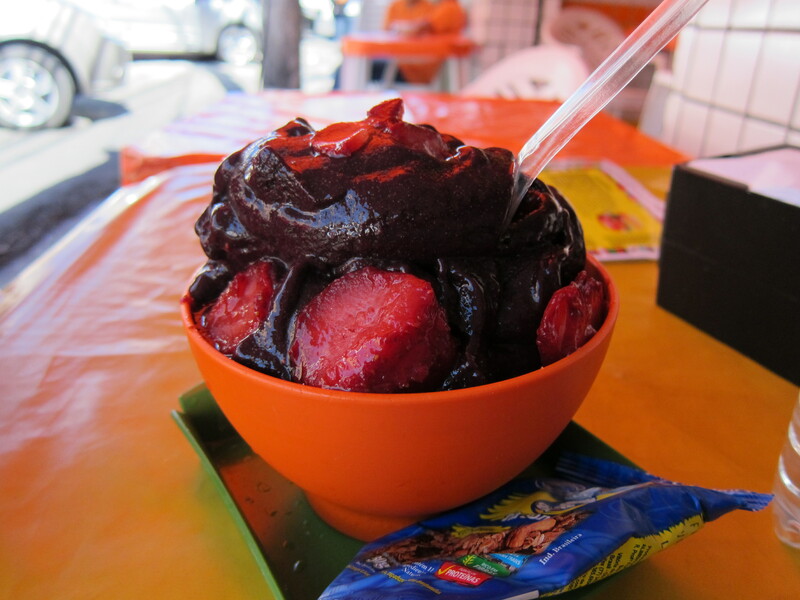 – and try all three to determine the ETW Best Açaí in Salvador. We should state now that between the three places we tried, we found no substantial taste difference between the actual açaí. It all came down to the extras. First up: Suco 24 Horas, the longtime reigning champion. Pluses: the açaí, like the others we will review, was ice-cold, with a rich, velvety flavor. Our server separated our order into two bowls (always helpful), and the free granola topping was a solid touch. We left very happy with our purchase: R$10.00. Second: Bom Sabor. We initially felt bad for Bom Sabor, since everyone was sitting at Suco 24 Horas, and the nice front-of-house hostess there seemed unable to convince anyone to stop by. But the second time we came back, there were a few people, probably because Suco 24 was full. That said, we left very impressed: though the serving size (700mL) was the same size as at Suco 24, it sure looked like more to us. Our toppings – banana and strawberry – were both fresh, and the granola at Bom Sabor was also free (and the same variety, Tia Sonia). Total cost: R$10.50, and an extra point for having a festive orange bowl (as opposed to the bland ones at Suco 24h). Last up: Fabrica de Sucos. Note, savvy readers, the lack of photo. Fabrica de Sucos was out of the running as soon as they decided to charge us for granola. When the two places next to you are giving granola away for free, you had better be producing so darn good – ney, damn good – açaí for us to consider you. But your taste was no better, if not slightly worse, and the granola was exactly the same as at your two competitors. Sorry! For us, the winner was pretty clearly Bom Sabor. We thought their portion was more generous, we like their toppings better, and frankly, they had a more enjoyable bowl. We’ve made two trips back since our initial taste tests, and we are still confident in our decision. And after a hot and humid day of walking around Salvador, there really is nothing more refreshing than a good açaí bowl from Bom Sabor.